If you work our at the gym, play sport or spend time gardening or even doing house work CARS (Controlled Articular Rotations) can help to compensate for always performing repetitive movements in specific ranges of motion. Why learn joint CARS in general?? 'All exercises in fitness are made up'. Let that sink in. Why do we squat? Bench press? Stretch? Etc. Is it for looks? Performance? Health? Fun? Each exercise has benefits but these are specific, and the movements are made up. Excluding running/walking, no exercise is really more 'functional' than the last other than for what it is made for e.g. moving a barbell. Nevertheless, the resultant gains in strength, control, bone density etc may be beneficial for your goals and health. And exercise is fun and everyone has different interests! Which is why we often devote hours to such pursuits every week doing specific made up exercises. A lack of balance in such training programs and poorly executed repetitive movements can lead to adaptive tissue changes, injury or pathology. Is your training technique or regime going to be conducive to longer term musculoskeletal health? In the majority of cases our interpretation of a balanced fitness regime does not consider our ongoing joint and connective tissue health. What our joints, muscles and nervous system crave is VARIABILITY. Performing regular CARS exercises compensates for the LACK of variability in our movements or the highly specific ways in which we train, work, compete. Like brushing your teeth, CARS are the equivalent of brushing your joints. So there you have it. CARS help to compensate for the lack of variability in our movement, with the aim of maintaining and improving our joint health now and into the future. Good preventative maintenance that fosters independence, not fads and shams. Credit to Functional Anatomy Systems for knowledge and principles applied. Functional Range Release (or FR) has been defined as an advanced and comprehensive system of soft tissue assessment, treatment and rehabilitation used by some of the most highly regarded manual therapists around the world. 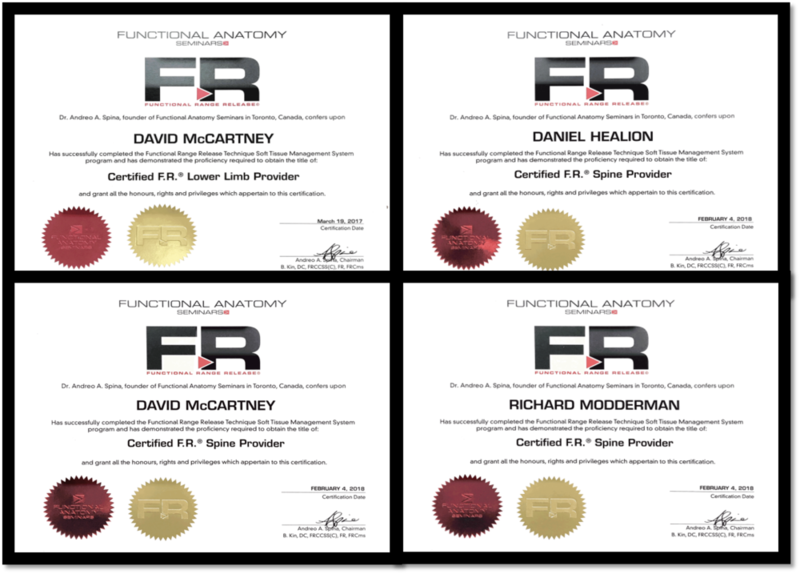 After another weekend of study David, Danny & Richard are all now certified FR practitioners. We are working towards incorporating the whole Functional Anatomy System into our practice with the addition of FRA & Kinstretch to come this year whilst working with Marty & his FRC expertise. All of this will be used to provide an enhanced treatment system with multiple options for patients who want to explore and improve their mobility either after an injury or to help prevent one. Most of us brush our teeth multiple times a day to keep them healthy and promote longevity. This has become a standard daily activity begun as children under parental instruction for generations now. We do this because teeth are important in allowing us to partake in our day to day lives. Why is it then, the majority of people do not have a daily routine to look after our joints? Joints allow us to move and perform our activities of daily living. A poorly performing, painful joint can make life extremely difficult, similar to unhealthy teeth. So why are we not trying to optimize and manage our joints on a daily basis like we do our teeth. Controlled Articular Rotations, or CARs, are defined by Dr Andreo Spina as “Active, rotational movements at the outer limits of articular motion”. Without getting technical, CARs aim to isolate movement to a single joint and explore this joints capacity through its available range of motion. They help to maintain the integrity of a joint and can improve a poorly functioning articulation. The beautiful thing about CARs is their ability to be used for varying needs. In the presence of joint dysfunction CARs can be used for rehabilitation, joint maintenance can be performed with a daily routine or joint training with higher levels of muscle irradiation. The awareness of a daily routine is what we want to focus on here. Use it or lose it!, right? We have all heard this term and many of us use it in respect to movement. Stop and think for a second, when was the last time you had your shoulder rotated to reach as far behind you as possible, or your hip rotated to hold your knee as high off the ground and out to the side as you are able? These are not positions the majority of people require on a daily basis, which means they are not being used regularly, and remember the saying, use it or lose it! You may not use these positions often, but in an instance when you are required to move into a position you rarely use, you want your body to have the ability to do so. Movement activates mechanoreceptors in our tissue. These mechanoreceptors provide feedback to our brain about the movement being performed. The more information the brain gets the better we perform, this is why repetition helps improve learned activities. CARs help to optimize the muscular control of joints, limiting unwanted repetitive forces due to sub optimal movement, thus maintaining joint health and helping prevent injury. Above is an example of shoulder CARs. For the daily routine a small amount of tension should be held in every muscle and the rotation should be performed slowly three times in each direction. The aim is to isolate movement to the target joint and avoid compensation from other joints. To finish we will use another quote from Dr Andreo Spina. CARs should be performed "Every Damn Day!" Pain originating from muscles and fascia (myofascial pain) is one of the most commonly encountered problems seen in physiotherapy practice. Furthermore, myofascial pain is among the most common chronic musculoskeletal conditions. Myofascial pain often originates from 'trigger points' - palpable, irritable bands within a muscle that are painful on compression and may limit range of movement by increasing a muscle's sensitivity to stretching. Trigger points may also refer pain to sites away from their location through neurological pathways. With the adverse symptoms and commonplace occurrence of myofascial pain and trigger points, it has become a topic of heavy interest - and there are several opinions on how it can or should be managed. One approach that can help to reduce muscle tension and improve movement is to employ deep pressure over sites of pain and restriction, combined with active contraction and lengthening of the muscle through range. This is sometimes referred to as a functional release or mobilisation with movement. When properly executed this can lead to immediate improvements in range of movement and reductions in pain. However, there is still debate as to how long these effects last, and such therapeutic techniques need to be a part of a comprehensive program for addressing a myofascial condition. In our blog video this week we present a short routine for performing muscle release techniques on the lower limb using a trigger ball ( lacrosse ball, tennis ball or hand ball makes a good alternative). We often see patients who complain of lower limb muscular tightness, pain or restriction as a limiting factor in their running, gym programs or sport. The release techniques shown can allow improved range of motion and movement control in your hips, knees and ankles when employed before activity. The video shows 5 techniques. In the order they appear they are - a calf release, fibularis release (side of calf), vastus lateralis release (outside of thigh 'ITB'), rectus femoris/vastus intermedius release (front of thigh), proximal hamstring muscle release (back of thigh below pelvis) and a gluteal muscle release (bottom muscles). In each case the trigger ball is positioned over the area of pain and tension in the muscle, then the individual moves the muscle through range under pressure with the movements shown. Stronger release can be added by attempting to push your body off the ground by directing pressure into the ball through the affected region. This is repeated for ~ 2 mins until a sensation of relief is felt. Importantly, do not push through intense pain (moderate pressure accordingly) and do not position the trigger ball over bony prominences. If adverse symptoms such as pins and needles occur do not persist. It is worth noting that for the hamstring release a tool is used made of 4 tennis balls taped into a pyramid - this allows a nice stable base for a trigger release to be performed. It can also be used on a variety of other body areas and is a very handy tool! See the picture below to make your own for a few dollars with some tennis balls and strapping tape. Specific self applied tools can also be purchased online for trigger point therapy if budget is not an issue. If you are experiencing muscle tightness, pain and restriction that is limiting your movement and exercise talk to your physio about how to manage this. Employing some of these muscle release techniques may assist you in returning to exercise pain free and with improved mobility and movement control. A short article on the physiology and management of myofascial trigger points is listed below for further reading and to improve your knowledge of this topic. Until next time, have a ball with these muscle release techniques! Lavelle ED, Lavelle W & Smith HS 2007, 'Myofascial Trigger Points', Anesthesiology, Vol.25, pp. 841-851. Running is a popular past time for many people, be it athletes, weekend warriors, or those setting out to improve their health or lose weight. However, with our busy lives we often neglect to take the time to properly warm up before we go on our daily jog, which may increase our risk of muscle strains or cumulative injuries. So how can we ensure an effective warm up when we are low on time with our daily routine? The answer is with an effective dynamic warm up! 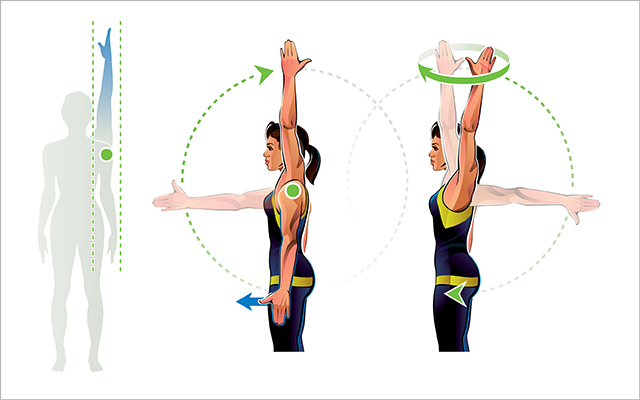 Rather than holding prolonged stretches that can be tedious and of limited effect, a dynamic warm up involves movement. It aims to prepare our body - specifically our leg muscles, joints and nervous system - for the forces encountered when running. This is done through drills that employ different components of the running movement. In this way it 'primes' our musculoskeletal system and nervous system to the load and movement that it is about to experience. This can help us to move better and reduce the risk of subsequent strain or injury. The video below shows a sequence of three dynamic warm up exercises that can be performed prior to running. Perform each exercises for 1-2 mins before you go for your daily run. It is simple, quick and effective if you are short on time and looking for bang for your buck! The first exercise is a drill that alternates between a hamstring stretch and a hip flexor stretch in the half kneel position. To stretch the hamstring dig your heel into the ground, lean forward and poke your tailbone back. Then to stretch the hip flexor on the opposite lean forwards to extend the opposite hip whilst you remain upright. This is repeated on the opposite leg. By alternating between these movements it helps to warm the legs up for striding back and forth at the hips. The second exercise is called 'sprinter marching'. Use a wall, pole, or bench to lean forwards and push with your upper body and legs, as though you are trying to shift a weight along the ground. In this position alternately push up and down onto your toes, pressing your heel down into a calf stretch movement at the bottom of each repetition. This mimics the action of the calves where they lengthen whilst contracting as we run. Make sure your movement is smooth and controlled at a moderate pace. The final exercise involves bounding and landing on one leg at a time. Practice landing with a soft knee, and lean forward slightly at your hip. This will help your leg to shock absorb more effectively. Try to 'stick' each landing, holding a stable single limb stance, before you bound on again. As for any sort of warm up or exercise there are many variations, and depending on the individual static stretches or other drills may be clinically indicated. try out this dynamic warm up before your next run and talk to your physio about what else can be done to make your running efficient and effective! When any nerve is irritated by direct mechanical pressure, friction or inflammation, it can lead to referred pain and altered sensation in the areas of skin that the nerve supplies. Sustained mechanical pressure on a nerve cuts off blood supply and causes pain and numbness. Irritation of a nerve by inflammation or friction leads to pain and tingling sensations. In the case of the sciatic nerve, these referred symptoms are felt in the buttock and the back of the thigh, or in the calf where the sciatic nerve splits into the fibular and tibial nerves. Now, the nerves in our body glide and move around as the rest of our body moves. This movement of nerves is referred to as 'neuro-dynamics'. Normally this movement is free and unlimited, and nerves slide and glide inside a protective sheath without being pulled taught or placed under tension. In the case of the sciatic nerve, this nerve normally slides up and down in our leg freely, and the nerve roots that supply it move in and out of the spine freely. When there is a pathology that makes the sicatic nerve sensitive, its neurodynamics can be compromised. When a nerve is sensitive, the surrounding muscles will generate tension to try to keep the nerve still. With normal movement, gliding of the nerve is now restricted and it may actually become tethered and placed on tension. This can cause even worse referred pain, tingling or numbness. For the sciatic nerve, this often presents as tension in the buttock, hamstring and calf muscles. Similarly, if there is a lower back pathology or buttock muscle problem ( such as piriformis muscle tightness) leading to a nerve being pinched, the sciatic nerve may be tethered at some point along its length. In order to treat sciatica effectively, physiotherapy and self management should aim to restore normal movement and gliding of the sciatic nerve and the spinal nerves that contribute to its formation. This can be done through specific nerve gliding exercises (sometimes called nerve flossing). Most importantly, these exercises do not stretch the sciatic nerve or pull it tight, rather they slide it back and forth. This has the effect of encouraging normal neuro-dynamics, and may reduce some protective muscle tone that is restricting movement of the nerve. As part of a multi-modal program, the incorporation of nerve gliding exercises helps to improve pain free movement and reduce referred pain. The videos below show some different exercises aimed at restoring normal gliding of the sciatic nerve and the spinal nerve roots that contribute to its formation. There are several variations, however these base exercises are usually effective. In the first video, the patient is laying flat on their back. Here they combine movements of their ankle and neck in order to produce movement in spinal cord tissue and the sciatic nerve. As they flex their neck they point their toes, and as they pull their ankle upwards they extend their neck (so the neural tissue is glided rather than pulled taught at both ends). This movement tends to produce gliding of the spinal nerve roots and spinal cord. As a final progression, this exercise can also be performed in a slump position sitting in a chair. Here the affected leg is held forward in full extension, and the patient flexes forward to a point of comfortable tension. Once again, they flex their neck as they point their toes, and extend their neck as they bend their ankle upwards. The final video shows another progression that aims to bias movement of the sciatic nerve as it passes through the buttock and the back of thigh. As for the video above, the patient sits in a chair slumped forward. Both limbs are flexed. As they straighten the knee on their affected leg, they extend their neck upwards. As they tuck their knee back in they flex their neck. Holding their ankle pointed up helps to add slightly more movement to the neural tissue. Each of these exercises can be helpful and effective, and the chosen exercise will depend on the severity of your symptoms. Make sure you approach nerve gliding exercises with caution, starting with only short applications of 30 seconds at a time, focusing on smooth execution. Monitor your symptoms and progress slowly to ensure you are not causing further irritation. Nerve gliding exercises should be reviewed by your physiotherapist and included as part of a more comprehensive program for managing sciatica. Talk to your physio about your sciatica and try adding nerve gliding exercises to get a leg up on your referred pain! Most of us have heard about core stability and more than likely tried at least one of what seems like an infinite number of different exercises to improve this core stability, but what exactly is our core? and why does it have to be stable? Simply put, our core is our body, the base on which our limbs move. When this base is stable it allows the limbs to function with more control and power. If you think about your body you will notice it is quite rigid in both the thoracic (chest) region and pelvic region due to bony structures, and less rigid in the abdominal region. For this reason core exercises are focused on strengthening the abdominal region, or maybe better put, the region between our rib cage and pelvis including both the abdominal and lower back muscle groups. Being strong in this region helps us maintain a neutral spine when needed, controls available movement and provides a stable base in more positions for our limbs to move on. The diagram above has a cross section of the abdominal region, highlighting how our muscles surround the abdominal cavity to control the spine. Control of the spine can be described as the ability to stabilize spinal segments and provide a strong platform for limb movement across varying positions. This control involves the synchronization of a number of muscles, each with their own task. Transversus Abdominus and Multifidus help control individual spinal segments due to their anatomical attachments spanning a single joint. The Obliques, Rectus Abdominus, Erector Spinae and Quadratus Lumborum are larger muscles spanning multiple joints and produce multi-segmental spinal mobility. These muscles work together to provide both movement and stiffness of this region as required. Strong core muscles reduce the load applied to spinal connective tissue and intervertebral discs which in turn decreases the chance of damaging this area. Building a strong core is not as simple as lying down and doing as many sit ups as possible. You want to challenge the different muscle groups in varying positions. The videos below show a few different ways of doing this. As mentioned before, there seems to be an infinite number of core exercises, these are some great ones for varying levels of ability. Bird Dog's combine both antero-posterior (forwards & backwards) stability with rotational stability. Maintain a strong core and slowly lift alternate arm & leg without allowing your body to twist or sag towards the ground. Aim for a straight line from wrist to ankle & hold for 5-10 seconds. This can be progressed by narrowing your base of support, bring your hands and knees together in your start position so they are close to the mid-line. Progress this further by raising up onto your toes as you perform the exercise. Most people who have tried to strengthen their core have performed planks at some point in time. To take this exercise to another level you can do single arm planks. This challenges the rotational stability as you prevent your unsupported side from dropping towards the ground. As with conventional planks, aim to hold for 30 seconds to 1 minute and as always, the main focus should be on correct form. Challenge yourself with some of these variations to core exercises. Build a Strong Core to prevent feeling sore! Children of today seem to gravitate towards phones, tablets and computers with no hesitation. This is where they find music, games, books, educational programs and the list goes on. It truly is a digital world we live in. With this comes the postural and lifestyle changes that we are all aware of, less movement and sustained postures hunched over devices. Unfortunately this is not going to change in a hurry, so much of today's world relies on these devices including learning, entertainment & work. With this in mind we have to come up with ways to combat the long term effects of using these devices. The Gross motor skills of children are suffering because of the time spent using technology and they are adopting sub-optimal postures. In short, Children are not out in the back yard running around as much as they used to. To counteract this we can try and get them doing some fun exercises to help improve posture and gross motor control. Any movement is good movement, to optimize it however we should focus on promoting movement in the direction opposite to any sustained or repetitive positions. A prime example of this is to encourage arching, or extension of the back to reverse the sustained hunched over, or flexed position of sitting at a device. We also should aim to incorporate multi-directional movement, balance, hand eye coordination and stability. Reverse posturing helps to counteract the hunched posture devices lure children into. Hanging and swinging activate muscles in an extended position and arching to pass a ball over head helps to stretch out a tight anterior chain (chest & shoulders). Rolling helps to activate our core muscles and jumping is an essential gross motor skill. A simple obstacle course can be fun, most importantly, and also challenge hand eye coordination along with balance and the ability to jump and land. Bear crawling requires rotational stability through core muscles and activation of the diagonal kinetic chain. The above videos show a few different activities that children of all ages can perform to varying degrees. The options are endless. Make them fun and get out and enjoy the activities with them. Foam rolling is something we see a lot in the gym, at the physio and in articles/blogs on health and fitness. It involves the use of a hard foam cylinder to apply deep pressure and shear forces to muscles and connective tissue to increase mobility or range of movement. Indeed, in the clinical setting patients report that using a foam roller helps them move more freely and with less pain or stiffness, and that it helps to eliminate 'knots' or muscle tension. There are various opinions on how to use a foam roller effectively, and different ideas on what effect it has. So what is the best way to use a foam roller, and how can foam rolling help you? Not sure how to use your foam roller? Let us show you how! Through some combination of the above potential effects, foam rolling leads to people moving more freely and increases the range of motion around the joints where it is used. So there is a positive effect that can have good outcomes. But when should we foam roll, for how long, and how often? As a final note we believe that any technique for improving range of movement should be coupled to techniques for improving neuro-muscular control in the range gained. So foam rolling should be coupled with exercises to focus on muscle control and stability as well - but this is a conversation for another day. It's the new year and many of us set resolutions to improve our fitness and shed some holiday kilo's. This sees a lot of people hitting the gym and pounding the pavement far more than they have in a long time, and maybe even pursuing new activities such as triathlons, cycling, weightlifting or cross fit to name a few. While all exercise has great health benefits, the initial enthusiasm of a novice athlete embarking on a fitness quest without the right approach can lead to accumulated injuries. If the individual has old injuries, weak areas, stiff joints or tight muscles problems may be even more likely to occur. So how can you avoid injuries as you embark on your new years fitness resolutions? In short there is no quick fix to ensure that everyone is injury free when they return to exercise, and unavoidable injuries do happen. However, with a logical approach and some simple preventative exercises you can help to ensure that you remain injury free as you return to exercise. Below lists our top five pieces of advice for returning to exercise, and then five exercises to incorporate into your warm up and cool down regime that are beneficial for injury prevention. 1. If you have any pain or old injuries/niggles, have these addressed by a medical professional before starting a program. This will allow resolution through proper treatment and also for an appropriate program to be developed so that your training does not lead to further injury. Don't ignore any old niggles as these often progress to more serious injuries when they are left unchecked! 2. If you are a novice athlete/gym goer, try to consult with a health and fitness professional at least once to discuss your goals and to learn the ropes for correct and safe exercise technique and programming. Too often people have the best intentions with their gym/exercise, but their poor technique or programming leads to acute or overuse injuries being sustained. If you cannot afford the time or money to consult with a trainer, try to meet with friends or family who are experienced in regular exercise and learn from their advice too. 3. Incorporate strength training into your program! Strength training has an array of health benefits that are conducive to health and fitness and injury prevention. Strength training helps to maintain healthy muscles and tendons, reduces the risk of muscle and tendon injuries, maintains joint health and increases bone density. Increasing lean muscle mass by building some muscles also helps to improve metabolism for weight loss, and exercising our muscles helps to moderate blood sugar levels (useful for managing diabetes). Now, strength training does not mean you have to be undergoing a weightlifting program and bulk up! It simply means incorporating some training with dumbbell/barbell/cable resistance, or even simple body weight exercises, to work your muscles at a moderate to high intensity. 4. Variety is the spice of life - chose a variety of exercises in your weekly exercise regime. Choosing a variety of exercises will not only make your exercise more enjoyable, but it will offer a wider and more complete array of health benefits for you. For instance, you may chose to perform some muscle strength exercises two days a week, running/swimming/cycling on another two days and perhaps on the weekend something fun like a social sport or recreational activity. Where you have more specific fitness goals in mind e.g. bodybuilding, distance running, you may have a more regimented regime to achieve your desired outcomes - but even here, try to vary your program regularly to make I enjoyable, achievable and to force your body to continually adapt. 5. Keep things simple and achievable, and gradually increase intensity and duration of exercise. If you are new to exercise, don't expect to achieve huge things very quickly and don't set yourself ridiculously difficult or strenuous training to complete. The physical adaptation of the cardiorespiratory and musculoskeletal system when exercising takes up to 6 weeks to begin to takefull effect. Start simple and set yourself achievable goals for your exercise each week. This may be as simple as starting with a 10 minute walk each day. By gradually increasing the intensity and duration of each session you will be more likely to stay committed and positive, and it will also mean you are less likely to suffer an acute or overuse injury by doing exercise that you are not yet ready for. 1. Thoracic mobilisation with foam roller: Laying on your back with the foam roller positioned across the middle of your back. Lift your arms up and down, breathing in deeply as you raise your arms, exhaling as you lower your arms. Try with the roller in different positions from the base to the top of your shoulder blades. Perform for 2-5 mins. 2. Hamstring & calf stretch: Laying on your back, use a stretch belt or towel hooked around the ball of your foot. Lift your leg upwards until you feel a stretch in your hamstrings and calves, keeping your knee straight. Hold here for 20-30 seconds, repeating 3-5 times. 4. Foam rolling lower limbs: Use a foam roller to release off the tight muscles in your thighs and buttocks. In the video we show how to release your gluteal muscles (bottom), vastus lateralis/ITB complex (outer thigh), hamstrings (back of thigh) and quadriceps (front of thigh). For each muscle, roll gently with firm pressure for ~ 1 minute. 5. Trigger ball shoulders/upper back: To release tension behind the shoulders, position a trigger ball between the back of the shoulder and a wall. Hold your arm across your body and move side to side with firm pressure. To release tension between the shoulder blades, position the trigger ball mid shoulder blade region, just to the side of the spine. Hold firm pressure and move side to side. With some simple and logical approaches to your exercise you can help to ensure you remain free of injury and on track to achieving your new years fitness resolutions. Try some of our recommendations and get out there!